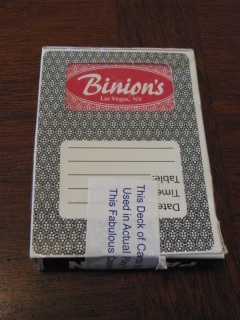 One deck of genuine cancelled playing cards from Binion's Las Vegas. 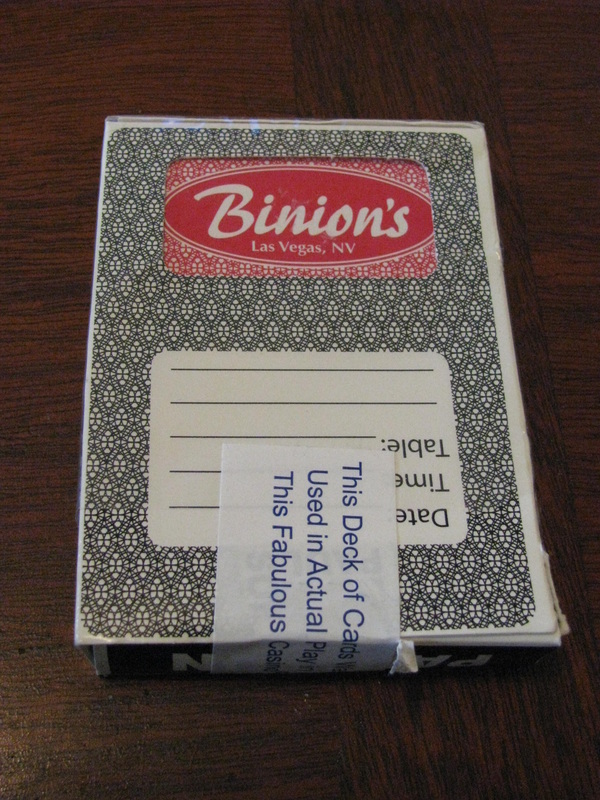 Made by Paulson, these great cards were actually used at the casino, cancelled and re-packed. (A paper seal on the deck notes this.) The decks have a superb card stock and come in a Paulson window box that shows the casino logo in the window. The "casino use" box is unmarked. A great buy, perfect for your casino party or home game. 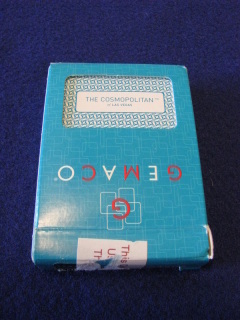 Genuine cancelled casino cards: Gemaco "Cosmopolitan Club, LV"
One deck of genuine cancelled playing cards from the Cosmopolitan Club, Las Vegas. Made by Gemaco, these great cards were actually used at the casino, cancelled and re-packed. (A paper seal on the deck notes this.) The decks have a superb card stock and come in Gemaco box that shows the casino logo in the window. The "casino use" box is unmarked. A great buy, perfect for your casino party or home game. 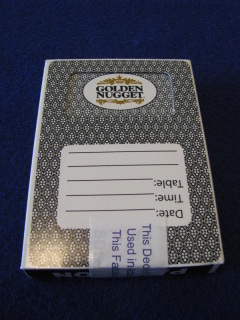 Genuine cancelled casino cards: Paulson "Golden Nugget, LV"
One deck of genuine cancelled playing cards from the Golden Nugget, Las Vegas. 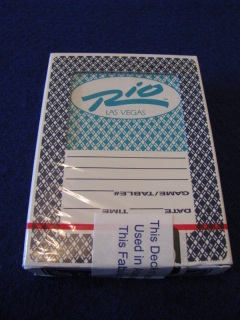 Made by Paulson, these great cards were actually used at the casino, cancelled and re-packed. (A paper seal on the deck notes this.) 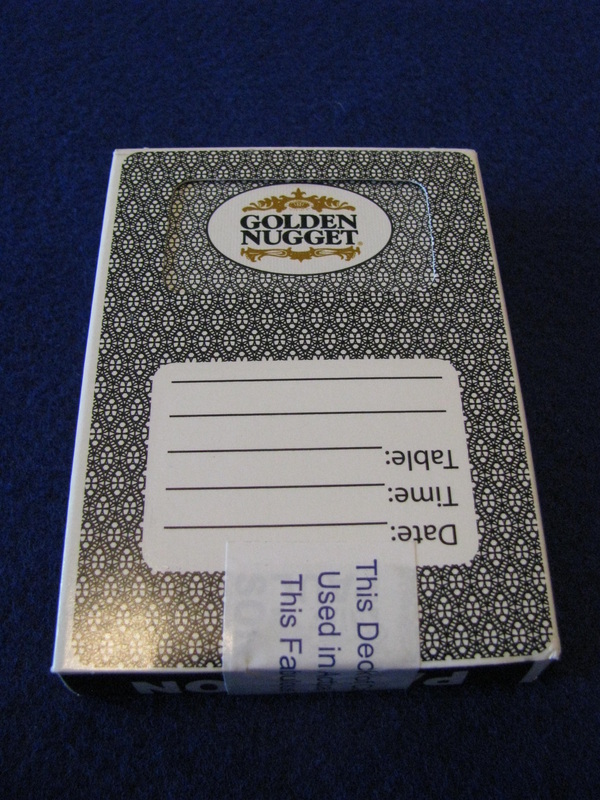 The decks have a superb card stock and come in Paulson box that shows the casino logo in the window. The "casino use" box is unmarked. A great buy, perfect for your casino party or home game. 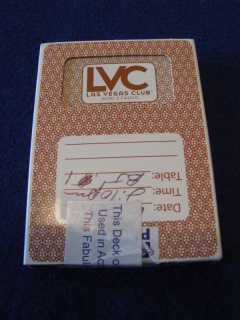 Genuine cancelled casino cards: Paulson "Las Vegas Club"
One deck of genuine cancelled playing cards from the Las Vegas Club in Las Vegas, Made by Paulson, these great cards were actually used at the casino, cancelled and re-packed. (A paper seal on the deck notes this.) 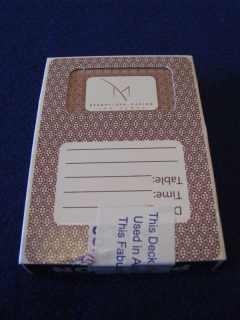 The decks have a superb card stock and come in Paulson box that shows the casino logo in the window. The "casino use" box is unmarked. A great buy, perfect for your casino party or home game. 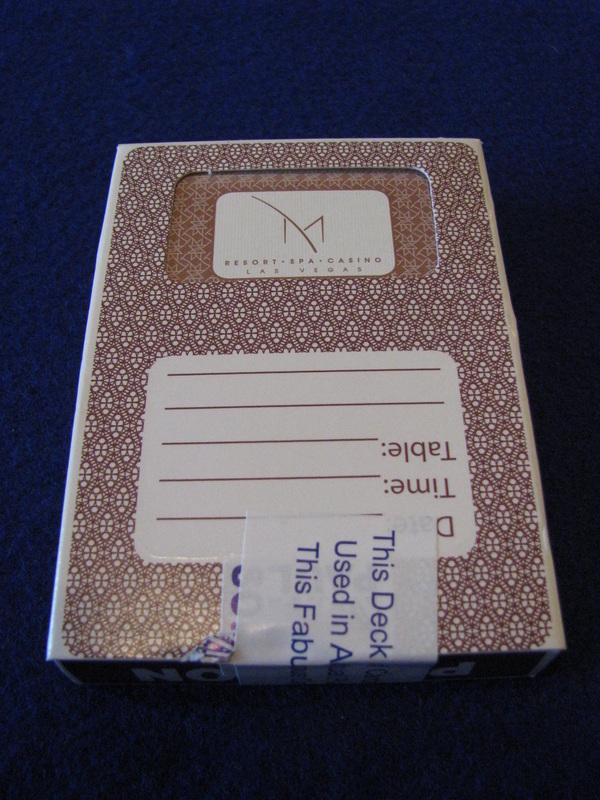 One deck of genuine cancelled playing cards from the "M" casino, Las Vegas. 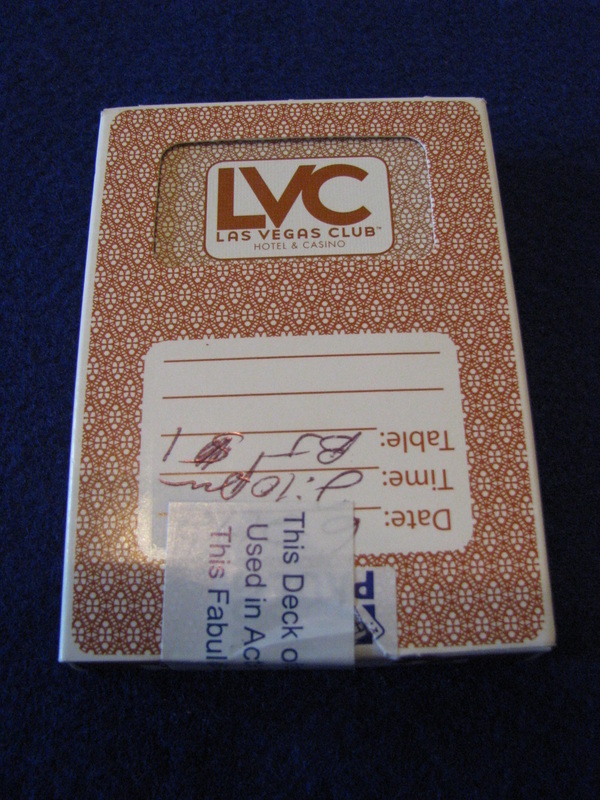 Made by Paulson, these great cards were actually used at the casino, cancelled and re-packed. (A paper seal on the deck notes this.) The decks have a superb card stock and come in a Paulson window box that shows the casino logo in the window. The "casino use" box is unmarked. A great buy, perfect for your casino party or home game. 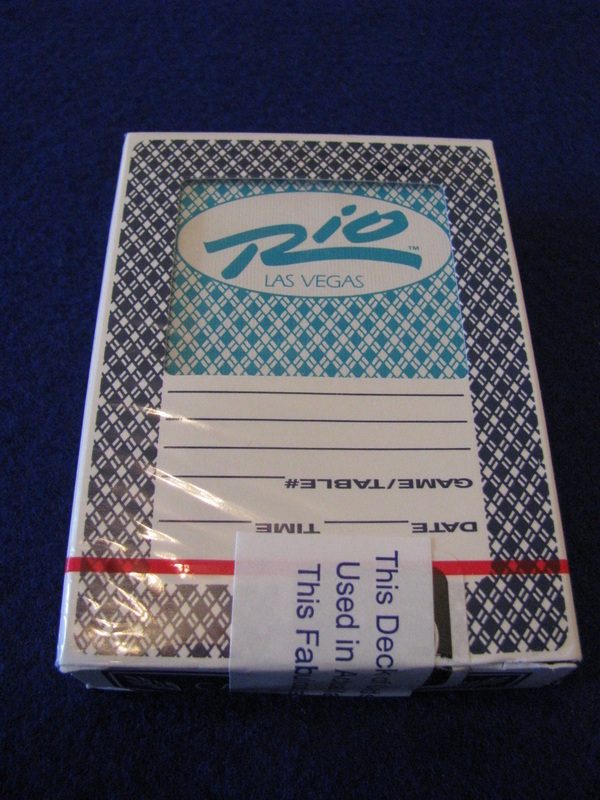 Genuine cancelled casino cards: USPC "Rio Casino, Las Vegas"
One deck of genuine cancelled playing cards from the "Rio" casino, Las Vegas. Made by U.S. Playing Card Co., on their "Aristocrat" card stock, these great cards were actually used at the casino, cancelled and re-packed. (A paper seal on the deck notes this.) The window box shows the logo. The casino use box is unmarked. A great buy, perfect for your casino party or home game. 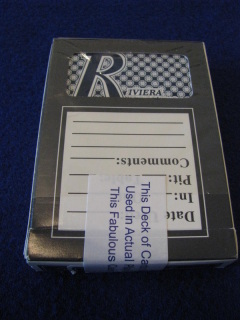 One deck of genuine cancelled playing cards from the Riviera Casino, Las Vegas. Made by Gemaco, these great cards were actually used at the casino, cancelled and re-packed. (A paper seal on the deck notes this.) 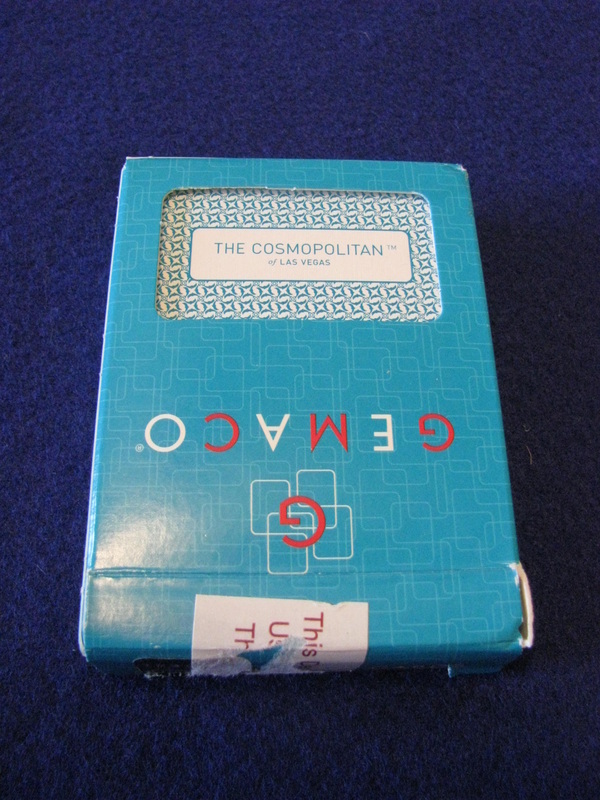 The decks have a superb card stock and come in Gemaco box that shows the casino logo in the window. The "casino use" box is unmarked. A great buy, perfect for your casino party or home game. Casino cards are "cancelled" after they're used to insure cards removed from play are not brought back into the casino to cheat. Casinos do this in different ways. The most common is to place the deck into a cutter and clip a small clipping from one corner of the deck. They're still usable for play after cancelling, and make great game prizes, gifts or souvenirs of your last trip to Vegas. Key West Resort & Casino - The finest casino that never existed.